As the flagship of Royal Caribbean Cruises’ Radiance Class of cruise ships, Radiance of the Seas offers a cruising experience to be remembered. Amid the beautiful sea views, floor-to-ceiling glass walls and fine decor, you’ll never be short of things to see and do on board. And that’s before you even get to the many stunning destinations on the itinerary. 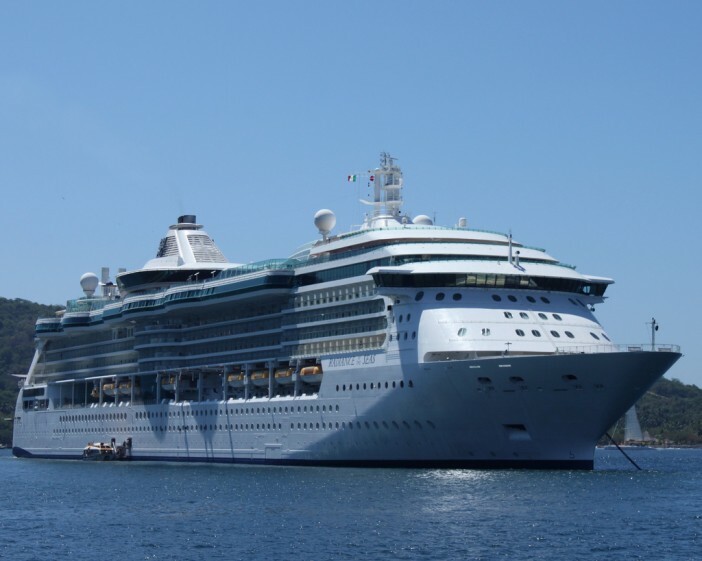 You can take a look at the latest Radiance of the Seas cruise deals here – or if you’d like to know more about the ship, keep on reading. The revitalised Radiance of the Seas now has a number of exciting new features that will make your time on board all the more memorable. Amongst these features are eight new restaurants and dining areas, including the more casual Boardwalk Doghouse, the Samba Grill Brazilian Steakhouse, and the family-friendly Giovanni’s Table. Something for everyone to enjoy! Meanwhile, the outdoor poolside movie screen will keep you entertained while you lounge around by the pool or swim a few lengths. And if you’re a parent looking for a little bit of me-time, leave the little’uns in the Royal Babies & Tots Nursery – they’re in safe hands. All the old favourites are still there, too: from the feature-packed fitness and sports centre to the Vitality Spa. You’ll never find yourself short of things to do between stops. Radiance of the Seas is all about luxury and relaxation, but that’s not to say you have to break the bank to enjoy a cruise here. There are rooms to suit all budgets and tastes. The interior staterooms represent the best value option – no sea view here, but all the amenities you’d expect in cosy and comfortable surroundings. You’ll still have your own sitting area, luxury bedding, private bathroom, TV, telephone and safe. Next up are the outside staterooms, which feature all of the above plus your own window out onto the ocean. Choose one of the Balcony staterooms if you’d like your own private area in which to take in the sea views and breathe in the fresh air – and enjoy a little more space in your room, too. Or for the best accommodation on Radiance of the Seas, choose one of the Deluxe Suites – the most spacious rooms on board, they’re full of nice touches that add to your stay. You’ll also get exclusive amenities like complimentary concierge service, priority check-in and departure, valet service and more. Cruise 1st Australia has all the latest deals on Radiance of the Seas cruises – check out our Radiance of the Seas page for more. If you can’t see what you’re looking for, simply use the search tool to find out what else is available. We update our cruise deals every day, so keep checking back to find your ideal cruise.